You will need a US J10/6.00mm Tunisian Crochet hook. 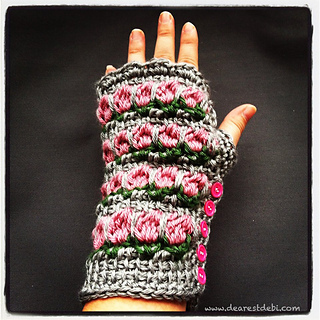 This pattern is written more like a regular crochet pattern. It uses the basics of tunisian crochet, the afghan stitch and stitch notes. I’ve made it as easy as possible for competent crocheters to work up. Includes photos for both Righty and Lefties! 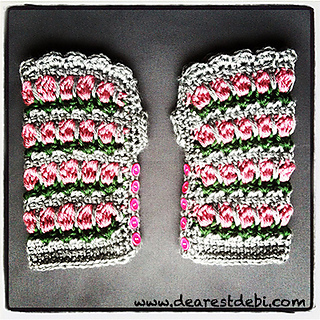 My cousin Jenn from Niftynnifers worked up instructions for wristlets to gloves on her blog. Instructions available HERE. There is a video tutorial available to show how the roses are worked. To view the video you will need to have a google account that you can use to log into YouTube. Please send me a PM if you are interested in viewing the video.